Exploring Louisville, Kentucky... 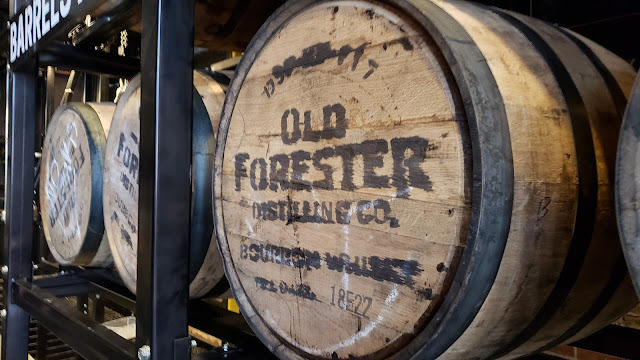 Bourbon Tasting, Hot Browns, Drag Brunch and More!!! Summer LGBTQ travel adventures in the Midwest! Richard and I arrived in Louisville after a nice, leisurely road trip from Indianapolis down through Bloomington and then the Hoosier National Forest. Gorgeous drive! We arrived in Louisville, where we checked in to the gorgeous 21c Louisville hotel, a melding of art museum and hotel. 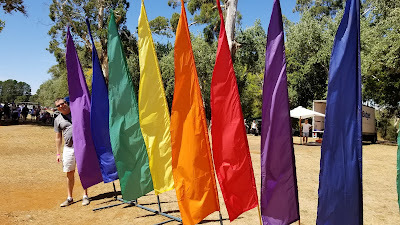 On the tail end of our trip to Australia, we decided to drive up from Melbourne to Daylesford to check out the ChillOut Festival, a rural LGBTQ pride event we hadn't heard of until this week. After a little over an hour's drive through gorgeous wooded forest and rolling hills, we found ourselves with hundreds of other LGBTQ folks in the small town of Daylesford. We perched ourselves onto a good viewing area from the sidewalk and watched the parade go by. Great fun! After Sydney Mardi Gras, we decided to do what appears to be a rarity in Australia... we rented a car and drove from Sydney to Melbourne. Locals universally thought we were crazy (turns out most seem to simply fly back and forth between the two cities), but it really was a beautiful 9-hour drive reminiscent of the rolling coastal hills of California. 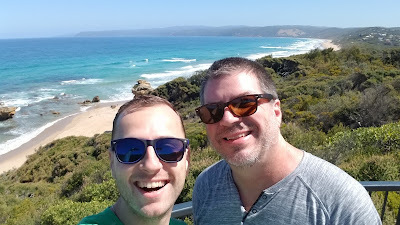 We started out our trip first thing the next morning and drove out of Melbourne and onto the Great Ocean Road. The first leg had us cruising along gorgeous inland and coastal routes, where we stopped a few times along the way. Before the event even started, we put together a mini-LGBTQ Influencer and New Media Conference... Matt Skallerud of Pink Banana Media presented on some of the latest in LGBTQ Digital Marketing in 2018, including some updates on the #ILoveGay network. We then launched into a panel with some of the LGBTQ influencers Tourism Whistler was hosting for this event, including the Nomadic Boys, Kit Williamson and John Halbach of Eastsiders TV, the Couple of Men, and Vancouver new media socialites Josh Rimer and Barb Snelgrove. After fueling up at the Taco Guild Gastropub in Phoenix, where the taco varieties are INSANE, we headed south, road tripping towards Tucson. 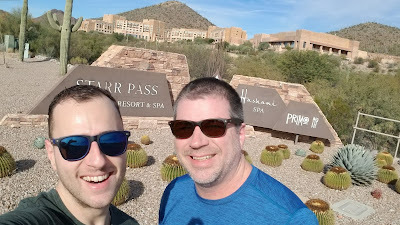 Richard is amazing with both finding great travel deals, and maximizing the world of status and points, so we chose the JW Marriott Starr Pass resort, based upon a combination of utilizing his points and status at one of the nicest properties in this part of Arizona! After checking in and getting settled, we headed down to the patio outside to enjoy a sunset cocktail, as well as the resort's tradition of welcoming the sunset with a special tequila toast.